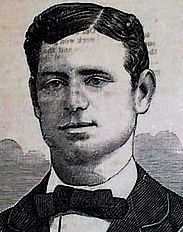 Long after “Dasher” Troy’s last professional game in 1888, he remained a good source of quotes for sportswriters; at the Polo Grounds, or after 1900, at his Manhattan tavern. And, humility was not his strong suit. Four years before he was given credit for fixing Hughie Jennings broken nose, Troy took credit for another player’s success. “Well, Amos did just as I told him the next game he pitched, and he was laughing in his sleeve. The minute he saw a batter’s left foot move back, he grinned all over. Then he let ‘er go. 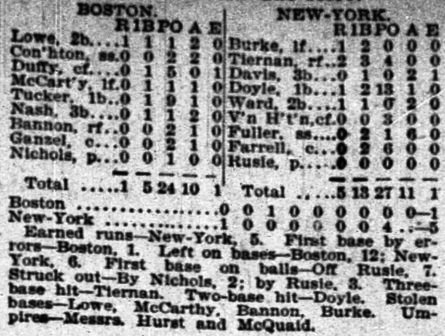 The ball whistled like a small cyclone up to and over the outside corner of the plate, and the batter made such a wild stab at it that the crowd roared. But nobody knew what the wrinkle was. “There were a lot of my friends there that day trying to show me, so they said how much I knew about the game. So I thought I would take a look at my old friend, Amos Rusie, who was pitching for the Giants. He never had more speed, and his inshoot was working fine on the inside corner of the plate… I sent one of my workmen down to Amos on the players’ bench with a note. In this note I told him not to pitch his inshoot, that nearly every one of the Boston Club was pulling his left foot back from the plate, and that the batter could not hit a ball out of the diamond if he would put them low and over the plate. There’s no record of Rusie having credited Troy as the reason for his greatest season. 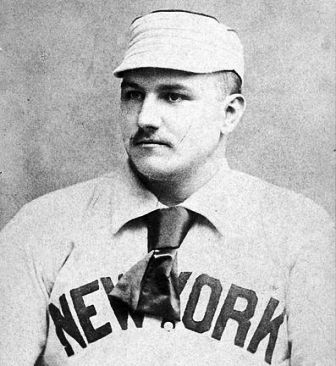 Troy remained a popular figure in New York baseball circles, and a popular story teller, until his death in 1938.